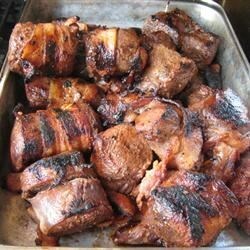 "Tender chunks of venison are marinated twice, and wrapped in thick bacon before being grilled until crispy on the outside. A venison version of Filet Mignon. This is a heavenly use of the best part of a deer. For the BBQ sauce, I prefer hickory flavored." I made this recipe for my hunter husband, brother and family - there was not a bit left. At the end I deglased the pan with cider-YUM. Will be making this again this evening for the WOW factor. This was very good and I am not a big fan of venison. There was no gamey taste. My husband loved it and wants me to cook it for his friends. I used a hickory flavored barbeque sauce.